Eleven Chicago scientists-turned-comedians — many of whom hail from some of the nation’s most renowned research institutes, including the U.S. Department of Energy’s (DOE) Argonne National Laboratory — cast aside their lab coats in October for a chance to educate the public through unconventional means. The performers, who hailed from the University of Chicago, University of Illinois at Chicago and Fermi Lab, were joined on stage by special guest Dr. Sidney R. Nagel, a Stein-Freiler Distinguished Service Professor at the University of Chicago, who had recently taken an improv class at the theater. Dolan, who co-created ​“The Excited State” with Yeva Shan, another ensemble member and postdoctoral researcher at the University of Chicago, said they hope to stage a monthly performance that uses the power of laughter to tackle scientific history, breakthroughs and common misconceptions. Mostly, though, they want their audience to have a good time. Dolan’s route to the stage was rather circuitous. Originally from Scotland, he earned his Ph.D. in engineering and physics from the University of Cambridge in England in 2017. While there, he was a founding member of the Cambridge University Science and Policy Exchange, through which he organized professional development workshops for early-career researchers interested in science policy. Dolan, now vice-president of the Postdoctoral Society of Argonne, came to the United States in August 2017 and lives in Hyde Park. His research includes the study of soft matter physics, the examination of materials such as polymers, liquid crystals and nanophotonics, the study of the interaction of light with small objects such as tiny flecks of metal. Dolan didn’t take to the stage again until earlier this year, enrolling in several improv classes at The Revival. He also received training from the educational organization Science Riot, which aims to grow the public’s enthusiasm about the sciences through innovative programming, comedy, outreach and entertainment. Dolan believes he will continue to use comedy as a means to draw people to the sciences. Already, his time on stage has improved his work inside the lab, he said. 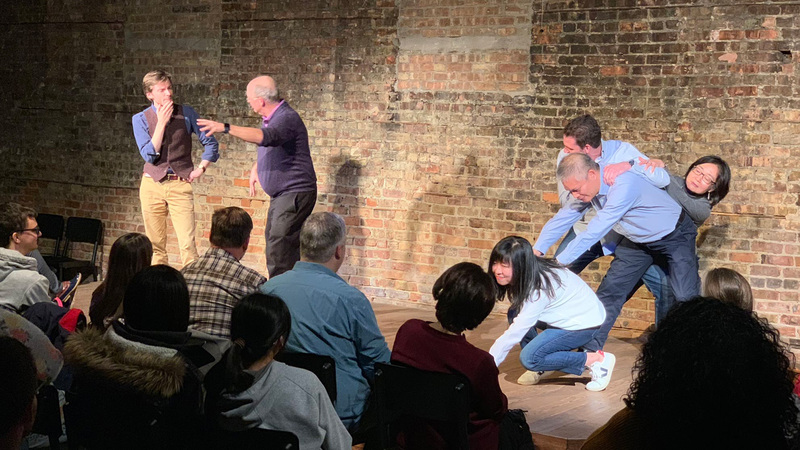 “Improv provides scientists with all the skills needed to help generate ideas for new scientific projects and building that all-important spirit of collaboration, including active listening and accepting and offering ideas no matter how outlandish they may seem,” he said. ​“The most exciting collaborations are about creating ideas and projects that neither scientist could have envisioned or managed alone,” Dolan said. The troupe took the stage again on January 17. Their special guest was Peggy Mason Ph.D., from the Department of Neurobiology at the University of Chicago. Women at Argonne, in more powerful roles than ever before, see a bright future for the laboratory, themselves and the next generation of women scientists.